Roger Federer turned up at Wimbledon on Monday resembling an army general ready to conduct his latest campaign and soon disarmed the opposition on the opening day of the grasscourt championships. The Swiss strolled on court in a white monogrammed military-style outfit, complete with a waistcoat underneath, and was soon firing winners past Taiwan's Lu Yen-Hsun to secure a 7-5, 6-3, 6-2 win in the first round. 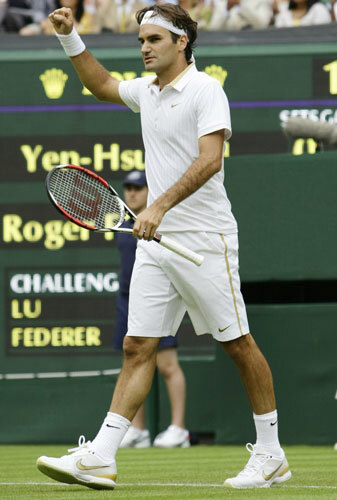 Federer had the honour of opening Centre Court proceedings, a privilege usually reserved for the champion, after his great rival Rafael Nadal pulled out with a knee injury. Although Federer's five-year Wimbledon reign was ended by the Spaniard last year, it was not long before he was acting every inch a champion and swatted aside Asia's only contender in the men's draw with a glorious forehand winner. "It's a very privileged spot, Monday 1pm, of course I feel honoured. I know Rafa deserved it more than I do this year but somebody had to do it and I'm happy they chose me. It gets your heart beating, that's for sure," the French Open champion said after beginning his pursuit of a record 15th grand slam title. Slovakia's Daniela Hantuchova ended the hopes of Britain's golden girl Laura Robson 3-6, 6-4, 6-2. The contest, which was the first held on the new sunken number two court, was opened by the Duke of Kent before a crowd including Bank of England governor Mervyn King and Virginia Wade, the last British female to win Wimbledon in 1977. Hantuchova said it had been a tough match because she had never seen Robson, who is ranked 488 in the world, play before. "It took me a while to get used to her game," she said. "It didn't feel very good being a set down and a couple games down and getting kicked by a girl 11 years younger than me." "Obviously, she's got talent," added Hantuchova, who reached the Wimbledon quarter-finals in 2002. "She still has many things to improve but I think she's on the right way, for sure." 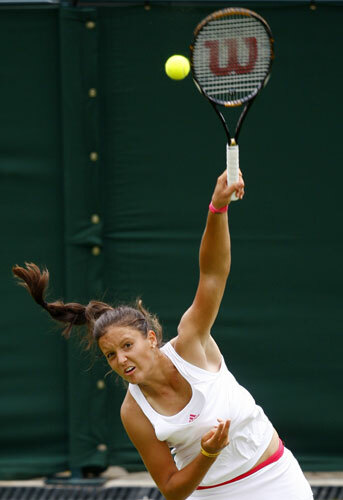 Nerves eventually got the better of 15-year-old Laura Robson on her debut in Wimbledon's main draw on Monday but a strong start and her plucky determination gave British fans a new young hopeful to get behind. Local favourite Robson, the youngest player to feature since Martina Hingis in 1995, started well, opening the match with an ace and breaking former world number five Daniela Hantuchova twice to take the first set to rapturous applause. The 15-year-old Robson, the youngest player in the main draw since Martina Hingis in 1995, had the distinction of winning the first ever point on the new Court Two when she fired an ace. "Before I went on I was completely fine. I wasn't nervous at all," Robson told reporters. "I was kind of thinking about what the towels were going to look like this year," the teenager added, giggling. "They're really nice!" Despite the crowd relishing the chance to get behind a fellow Brit, with regular shouts of "Come on Laura" every time she looked ready to give up, Robson slowly crumpled, getting visibly more annoyed at herself with every mistake. "I keep messing it up," she yelled out on court, screwing up her face in anger after one of 14 double faults. "I don't know what happened," she added. "When I was the break up in the second, I just got really nervous." "But I'm pretty proud of myself," said the youngster who sat her school exams two weeks ago. "I thought I played really, really good for a good part of the match." Fourth seed Novak Djokovic reached the second round at Wimbledon on Monday after a 6-7, 7-6, 6-2, 6-4 win over Frenchman Julien Benneteau, who called on the trainer at match point down after a nasty fall. Djokovic, the 2008 Australian Open champion, will face German qualifier Simon Greul for a place in the third round. Julien Benneteau called on the trainer at match point down after a nasty fall during his match against Djokovic. The world number 81, facing his second match point against the Serb, sprinted back to try to reach a Djokovic lob but then skidded into the screen at the back of the court. His racket flew out of his hands and he clutched his left knee in agony, with the trainer having to ice the injury for several minutes. Benneteau resumed to save match point before losing on the third and left Centre Court to a standing ovation.